The Diamond Creek is a tributary of the Yarra River joining it at Eltham. The Creek's headwaters are in the Kinglake ranges, just beyond St Andrews. Its name probably came from crystalline minerals observed on the bed of the creek. 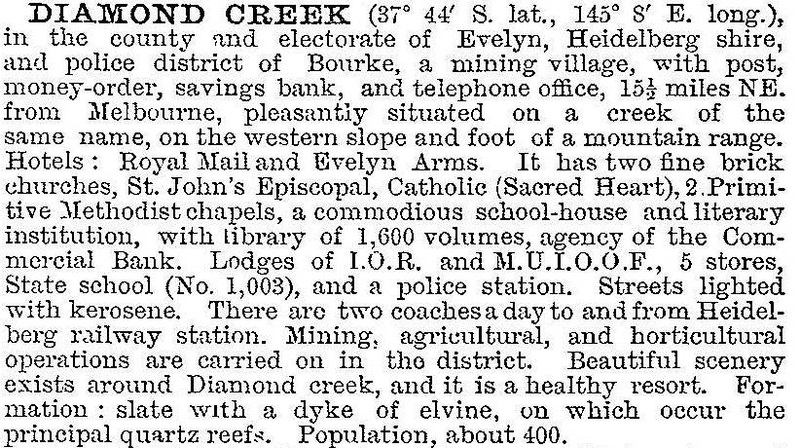 The township of Diamond Creek is 23 km north-east of central Melbourne, just north of Eltham, where Arthurs Creek joins Diamond Creek. Settlement was attracted to it rather later than the more open areas of the Plenty River and the Yarra River, and the first European inhabitants were mostly timber getters and paling splitters. Gold seekers opened up the Caledonia diggings further upstream in 1855, which were named after the Caledonia run (1841) situated near where the Diamond Creek township was later created. In 1863 the Diamond Reef was discovered resulting in substantial gold mine workings, which coincided with the formation of the township. A post office, Methodist church and a school were established by the following year. In 1866-67 the township was surveyed and named Nillumbik – the name of the Parish and the town's name which continued to be used until the turn of the century. The Anglican church (now heritage listed) was built in 1867-70. The opening of the railway line from Eltham to Hurstbridge in 1912 coincided with the decline of orcharding. Fruit from Doncaster, Nunawading and interstate from Tasmania had superior marketing. Ironically a Government cool store was opened in 1913. The railway line allowed better access for excursionists and picnickers, but wealthy Melburnians built their weekenders and spacious residences in other country retreats. 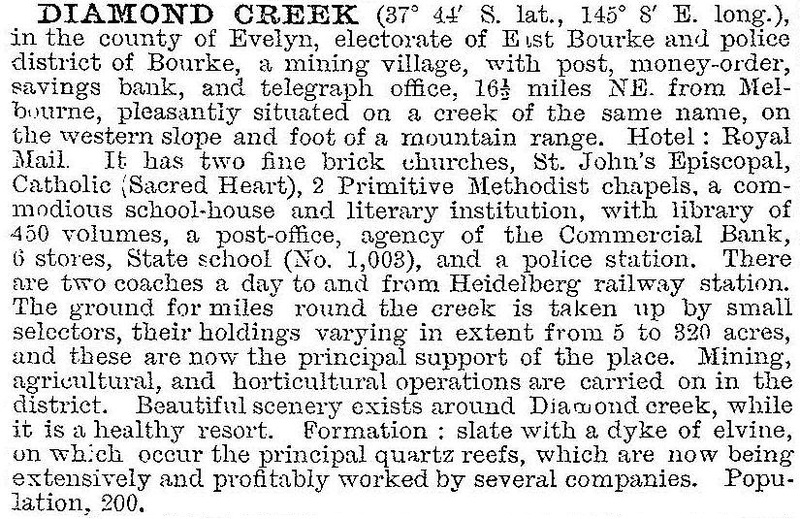 Diamond Creek remained a pleasant backwater, with no ostentation or evidence of wealth. Reticulated electricity, however, came to the town in 1928. The pressure of metropolitan expansion in the postwar years affected Diamond Creek and the townships further south in the Diamond Valley. Population growth was enough by 1964 for the creation of Diamond Valley Shire by severance from Heidelberg city. Substantial residential growth in Diamond Creek came in the 1970s, and Diamond Creek East primary school opened in 1971. There is a shopping centre near the railway station and a second centre, separated from the first by the railway line and the large Diamond Creek reserve. The reserve has several recreational facilities. There are two State primary schools, a Catholic primary school, a secondary college (1989) and a large community centre. The college replaced a technical school (c1974). Diamond Creek has an honoured place in Australian rules football. The Coventry brothers Syd (1899-1976) and Gordon (1901-68) played their early football for Diamond Creek and later for Collingwood in the 1920s-30s. Each won Collingwood's Copeland trophy and the Brownlow medal. Don Cordner was Diamond Creek's doctor for 46 years. He played for Melbourne Football Club from 1941 to 1950 and won the Brownlow medal in 1946.